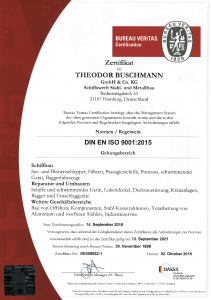 Since 1998 we serve our customers based on the quality management standard ISO 9001:2008 and the manufacturer’s qualification for welding of steel structures in accordance with DIN 18800-7: 2002-09. Beside the continuous improvement of our business processes, we also continue to optimize our system and constantly adapt to the current needs of customers, markets and employees. That means that we do not only meet our own standards, but also provide our customers with a consistently high level of quality. 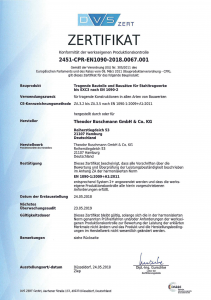 We are proud that the Theodor Buschmann GmbH & Co. KG successfully passed the last audit for re-certification of the ISO quality management system on February 2016, confirming its high quality standards.